North Korean leader Kim Jong Un (left) poses with South Korean President Moon Jae-in in April at the border village of Panmunjom. Moon's special envoy, Chung Eui-yong, announced the dates following a trip to the North. The meeting later this month, Chung said, will "discuss practical ways to establish lasting peace and ensure joint prosperity on the Korean Peninsula, especially denuclearize the Korean Peninsula," Yonhap News Agency reported. North and South Korea are officially still at war, because the 1950-'53 conflict ended with an armistice instead of a peace agreement. 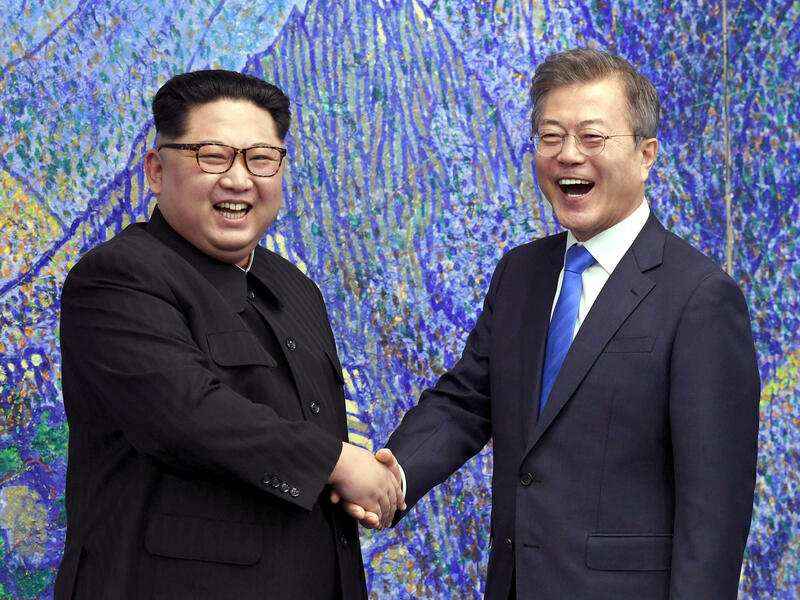 At their first meeting, the two leaders "agreed to formally end the war before the year's end," Yonhap added. Now, Pyongyang is pushing for a peace treaty — and is insinuating that the U.S. is standing in the way. "The United States shouldn't delay any further an end-of-war declaration, which the U.S. president promised at the Singapore summit," the North's state-run Rodong Sinmun newspaper stated in an editorial, Reuters reported. A peace declaration could put the U.S. in a tricky position. As Schmitz reported, "The U.S. has insisted that a peace declaration, which many see as a precursor to the removal of U.S. troops from the South, cannot come before the North takes more concrete action toward abandoning nuclear weapons." Last month, President Trump canceled Secretary of State Mike Pompeo's planned trip to North Korea. "I feel we are not making sufficient progress with respect to the denuclearization of the Korean Peninsula," the president tweeted at the time. Now, the South Korean envoy has a message for Trump from Kim, who apparently described the steps his country has made toward denuclearization as "very significant and meaningful," Yonhap reported. "(Chairman Kim) said his faith in President Trump remains unchanged. He made that clear," Chung said, according to the news agency. "Chairman Kim especially stressed that he has never talked negatively about President Trump to his staff or anyone else. And he said he hoped to end 70 years of hostile relationship between North Korea and the U.S. and realize denuclearization by improving the North-U.S. relationship within Trump's first term." Trump appears to have welcomed that message, writing in a tweet: "Thank you to Chairman Kim. We will get it done together!" Pompeo declined to comment Thursday on what the next steps are for U.S. diplomacy with North Korea. "There is still an enormous amount of work to do," he said.